At Davis Dodge, you could find yourself behind the wheel of a Chrysler Town & Country.The Chrysler Town & Country minivan's recognition for excellence is universal. It begins with a well-deserved reputation for Class-Leading innovation and power. Its powerplant is a three-time winner of Ward's '10 Best Engines' and the Town & Country itself is the industry's most versatile passenger and cargo vehicle. Accolades like these culminated in its selection as a 2015 Consumers Digest Best Buy. Talk with one of our representatives today, and learn why vehicle buyers come from Calgary, Lethbridge and Claresholm for a shopping experience at Davis Dodge. Cargo-carrying flexibility is at your fingertips with the available one-touch power folding 3rd-row seats that fold and stow in below-the-floor storage bins. Best of all, there's no need to remove a seat. Class-Exclusive 2nd-row Super Stow 'n Go® seats let you enjoy 101 mm (4 in) of fore/aft movement, making access to the 3rd row even easier. There's also Class-Exclusive tailgate seating for hanging out in parking lots, parks and anywhere else. Experience amazing passenger and cargo versatility with the Industry-Exclusive 2nd-row Super Stow 'n Go® and 3rd-row Stow 'n Go seats with Class-Exclusive tailgate seating. 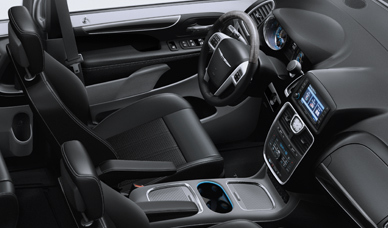 Beautifully executed design complements the real-world practicality of the one-piece instrument panel. Superior styling and soft-touch materials evoke the spirit of design behind Canada's ultimate luxury minivan. Built off the Touring-L model, this special package adds a power sunroof, heated steering wheel and hands-free communication with Bluetooth® streaming audio. An "Anniversary Edition" logo on the radio splash screen and floor mats provide the finishing touch to this stylish and value-packed model. Sumptuous touches unify the elegant design of Town & Country. The eye follows the exterior from the chrome grille featuring the Chrysler winged badge. Along its streamlined profile, your eye stops to enjoy the bright chrome bodyside and belt line moulding accents. At the rear, the refined impression culminates with LED taillamps, a body-coloured rear spoiler and chrome accents on the liftgate and step pad. Standard on the Town & Country, this Class-Exclusive system enables you to stow the crossbars in the side rails and snap them easily into place whenever needed. With the Stow 'n Place® crossbars stowed, wind buffeting and aerodynamic drag are reduced, resulting in better fuel efficiency and a quieter cabin. Power heated mirrors are standard on all Town & Country models. They fold toward the bodyside to provide clearance in tight situations and provide a heating element to help melt ice and snow. The mirrors are body-coloured on Touring, Touring-L, S and Premium models, while the Limited and SafetyTecTM-equipped Touring-L and Premium feature a chrome finish along with supplemental turn signals and driver's side auto-dimming. 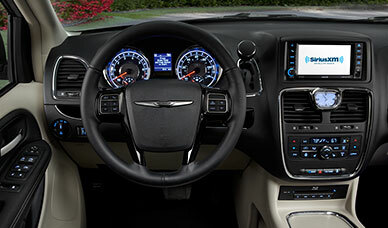 The Chrysler Town & Country offers you the convenience of the innovative fuel economizer mode. Push a button and seamlessly engage an overall more conservative driving performance including a revised transmission shift schedule to help improve fuel economy. Experience true driving pleasure in the Town & Country. It's equipped to offer refined control for the best possible ride. It begins with the suspension that features large-diameter rear shocks, smart damping control, a high-rate rear torsion beam axle and track bar bushings to help improve body control and deliver a confident driving experience. 283 horsepower and 260 lb-ft of torque, it enables you to tow up to 1,588 kg (3,500 lb). Elevate your driving experience with the standard and factory-installed SiriusXM satellite radio with one-year subscription. Enjoy an awe-inspiring selection of up to 120 channels, including commercial-free music channels and the best programming in sports, talk, comedy and news. Listen to what you want, when you want, in your SiriusXM-equipped vehicle. Radio 430N adds Garmin® Navigation. In the event of a rear-end collision, the active front head restraints move forward and upward, decreasing the space between the head restraint and occupant's head, reducing the risk of neck and head injury. The sturdy, lightweight single structure of the Town & Country features a stiff body and high torsional rigidity. For you and your passengers, this affords better impact protection, a smoother ride, better handling characteristics and less interior noise. 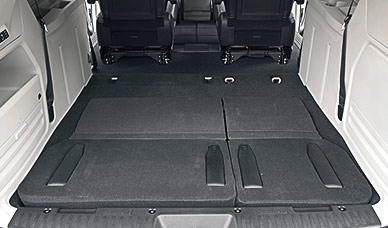 When the vehicle is shifted into Reverse, it automatically activates the standard ParkView® Rear Back-Up Camera. The camera image is displayed on the touchscreen and includes grid lines to show the proximity of your vehicle to any visible obstacles. Take a look at the Chrysler Town & Country today!